My cousin had her daughter’s birthday party at a trampoline park last summer, it seemed like a fun idea to make use of….borrow…steal. "But Dave! How could Amanda invite other kids to her party without definitively knowing the venue?!" Me: "Every garden needs a few holes dug in the plot." Re the commentary: Amanda doesn’t have to be the one to write the invitations. @Alcor: That’d be a fantastic way to get the young girl with trust & anger issues to give you the stink eye for the whole night. I should know, I was a young boy with same. Phrasing it that way just ensures that if even one kid is not able to show for whatever reason (sickness, family disaster, etc), you’re the one taking the flak. I still remember that when I was 8 I was so grumpy over such a small thing. I’m not saying this from any position of expertise, since I have my own problems any time I attempt a profile, but Todd there looks like he has an underbite — and I’ve noticed this with other characters as well. Drawing faces is the hardest part of human anatomy,(well, hands might be harder, maybe, sorta, maybe). As humans we communicate so much through facial expressions, they are so important, and faces are so weirdly constructed, (filtrum? I mean Filtrum? Why? )that it is supreme insanity to try to do it, yet Dave here, maintains the illusion that we know these characters and can identify them on sight. Because you called that one Todd, as if you knew that it is the character Todd. The filtrum is related to the cleft architecture of many animals’ lips. Cats, dogs, and many other mammals have a full split. We have a filtrum. Feet are the hardest bit of human anatomy to draw. Hands down. The Simpsons’ oddities are a design choice, much like the choice here to make the profile’s mouth be nothing like a side-view mouth would actually look, because it’s more expressive in this style. I don’t think the underbite is deliberate; thus, calling attention to it (gently, I hope) can lead to improvement, “improvement” being defined as some combination of “more what the artist desired to create” and “less of an immersion-breaking oddity to the reader.” And, like I said, I have trouble with profiles myself; they’re difficult to draw! There’s also the issue of whether criticism is valuable in the first place, for a specific artist. Sometimes you know exactly what’s wrong but not at all how to fix it, and having it pointed out is just annoying or even destructive to your self-esteem. Sometimes you didn’t realize it was a problem, and having it pointed out can help focus your attention on parts of your art that can improve. Obviously it needs to be constructive criticism (as opposed to an attack: “Your art is bad and you should feel bad!” which is something I hope my comments never come across as). And there are some artists who just don’t want criticism of any kind — even constructive criticism — and that’s okay; sometimes an artist is dealing with enough problems of their own, or growing at their own pace, and don’t benefit from comments like that. Other times they’re struggling with issues that make small criticisms seem huge, and thus, again, not helpful. Every single time someone is drawn in profile in this comic, their mouth opens too wide. It looks like they have shark mouths, every time. This is a consistent issue that I’ve even stopped noticing… but yeah, now that you mention it, Todd’s lower jaw is jutting a bit forward, too. The over-long profile mouths are done to make the faces more expressionable, same with the too-large eyes. I tend to lean towards exaggerating the expressions a bit. To be fair the art is not exactly the pinnacle of quality here. I could say about ten thousand things, but I think the artist doesn’t particularly care about changing this? Comics aren’t fine art. A fine artist takes days or weeks to draw one human face realistically. A cartoonist has to draw humans several times a day. He develops shortcuts, unrealistic representations that get the point across without requiring excessive work. One notorious example is the frequent use of three rather than four fingers on a hand; it isn’t that eliminating one stroke saves enough time to matter, but that on the scale of a hand in a ‘toon, with four fingers the hand has to either be rendered well all over or look wrong somehow, but with three fingers it’s easier to pass at a glance. The bundle of shortcuts one cartoonist uses becomes his style, and I don’t see anything to complain about in Dave’s style. I’ll cop to not being the best artist, I’m C-Tier at best in most cases. But I don’t really agree that criticizing the cartoon-ish artstyle for having mouths and eyes an unnatural size is fair, you know? And I don’t quite understand your points about the linework and the texturing. With the linework I draw with a rough-edged brush to make it look a little bit more hand-drawn, rather than having the perfect smoothness vector lines would give. The texturing is just a way to help differentiate the backgrounds from the characters a bit, and add a little bit of an “on paper” effect. Ear placement and proportion, I’ma give you that one. Those are just plain slip-ups. I would say of the comics I read consistently yours is the one whose art has really grown the most, and I love that you haven’t been afraid to play with the style you use now and then. So – comic-strippy – heck yea, but it *is* a comic. Detracts from story? Not at all, to me. (You want some changes, though? And, on the topic of art improvement, have you ever checked out El Goonish Shive or Questionable Content? They are 2 of the 3 comics I always check on every update day (Selkie obviously being the 3rd). They’ve been going on since I was in high school, and they have massively improved from the first page to the present. Every artist has that thing they hate to draw and it is likely a part of the anatomy. I have gotten better at hands and feet and profile but I am not a pro by far. wings, tails, eyes, awesome. Poses and fingers? Screw that… I use models a LOT. Uh, Dave. Don’t be that artist. People are bound to criticize your work at one point or another. And it’s never going to be “Fair since it’s always going to be based on personal biases. You post it online, then expect people to do it. I mean, it works both ways though, there’s no reason I can’t refute or disagree with a criticism. It’s not some sacrosanct thing where it can’t ever be disagreed with. I don’t understand what you’re reacting to, DoctorDoctor. Dave’s remarks weren’t out of keeping, and he did accept part of the criticism as valid — that’s a normal, reasonable way of interacting with criticism. I see no reason to be all “Don’t be that guy” about this; he’s not flat-out rejecting criticism. As long as everybody keeps their cool, there’s room for a back-and-forth, not just a one-way thing. I like your ‘choppy’ lines and textured backgrounds. They make the characters stand out more. And I really like seeing you experiment, like last month when you were playing around with hatching. Exaggerated facial features is par for the course in comics. I’ve read a couple that had really realistic artwork, and while it did look amazing, it was somehow less immersive than a cartoonish style because you can’t pack as much expression into one panel as you can when you use cartoon anatomy. The ear thing… yeah, I struggled with that myself for a while. Good tip I learned was to make the top of the ear line up with the corner of the eye, and the bottom line up with the corner of the mouth. I kind of like that the art here is simple and utilitarian, it just works. Actual problems in other web comics I’ve often see is the art being too fancy or busy so it actually becomes difficult to take in what you are seeing at glance or follow the action smoothly. I think comics should be more about the story than art. When I think of busy artwork, I always flash back to Final Fantasy VII. The art was supposedly an improvement over the blocky retro graphics of titles 1-6, but in 1-6 I never got stuck in a train yard, wondering where the heck I was supposed to go, because the busy artwork made it hard for me to realize that I could walk up on top of train cars…. THANK CHRIST, SOMEBODY ELSE HAD THAT PROBLEM. I AM NO LONGER ALONE. I don’t think it’s a matter of Dave not caring to change, Alcor. I think it’s that his style is evolving, like every webcomic artist. He’s already come a long way, and there are parts that will continue to change and parts that will solidify as just part of his chosen style. I’m just not sure which parts are which, y’know? Have you seen Prince of Egypt? Because the lack of space for a brain can apparently be a stylistic choice in an actual movie in actual theaters, and not even a movie meant to be a cartoonish comedy — it’s a serious drama. I found it weird at the time, but it’s within the realm of acceptable variations. I’ve actually seen a number of styles that don’t bring the eyes down to the halfway point — I think because it feels like a lot more extra space than is necessary above the face. Some of your other criticisms (parts being too big, ears too high) will likely get better proportions over time*, while others (line work) may be deliberate stylistic choices, even if his ability to make the style work for him right now may be lower quality than you’d look for. And he’s experimented with shading and texture quite a bit over the history of the comic. So if Dave decided that adding better shading or more realistic texture takes more time and effort than he is willing/able to put into the comic right now, and is putting out comics without that, that’s a reasonable decision. I didn’t even pay attention to the shading until you said it, and there’s some shading present, just a very simple style right now, which is fine. One reason I try to remain open to criticism is that, frankly, I’ve been “evolving” for seven years now. I don’t accept “still evolving his artwork” as a personal excuse anymore. There’s a lot of days where I look at my comics and compare them to others, or have conversations like these come up, and I wonder if there’s some kind of deeper roadblock on my progress that I haven’t sussed out how to climb over yet. Wonder if she invited Selkie willingly or needed to be persuaded? Then again Selkie is now a budding Sith Apprentice so who even knows? 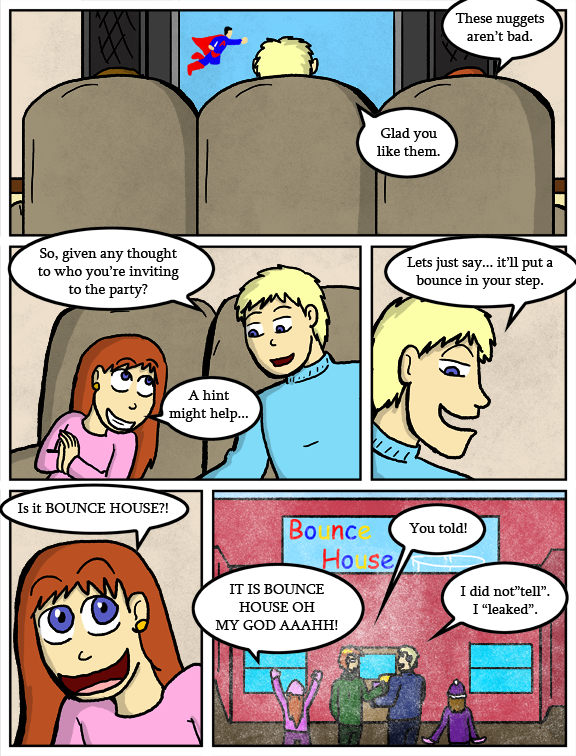 Come to think of it… could Selkie even safely bounce on a trampoline? I’m sure its safe for her. I’m just not sure if it will be safe for the bounce house ;). Eh, but thats the problem. Bounce houses aren’t very sturdy and when they go down they go down fast. My sister got hurt once at a school fair when the one she was on deflated (for some reason they started taking it down w/ a kid on it still! ), and it was hell to find her in the deflated fabric. Its a nightmare to think what would happen if she had been hurt worse and couldn’t move or knocked unconscious when it fell, she was pretty small at the time and it was a big mess of fabric. …..Actually even normally its really easy to twist an ankle or get kicked in the head (or gills?) when there’s other kids in them. I’ve never invited my little brother to my birthday parties. He just, uh, was there anyway because we live in the same house? In this case, inviting Amanda’s dad came with Selkie as a package. It is interesting exactly how Andi talked to her about it, true. the last panel is colored differently–other than selkie, it looks like watercolor. Or maybe really high-quality crayon. At first I thought it was snow, but then I noticed the sign was not also textured like that. Fun effect tho’. by now the sign, windows and selkie are fuzzy too. So apparantly it is snow. Yeah, it was done on the wrong layer originally. Had to shift it up a few. ok, now i´m jealous – the only place i ever had my birthday party – aside from home – was a bowling alley…..lame! If it’s like the ones in Silicon Valley, imagine ENTIRE ROOMS with trampoline-floors and padded walls. They’re great fun. Bill Gates’ mega-mansion in Washington State has a room like this, for instance. I just had a great idea, laser tag plus trampolines, like a tight maze with low walls so you try and snipe people as you reach the top of your jump, perhaps a series of rooms with crawl spaces in the ceiling so you can ambush people by dropping into a crowd of the enemy, think of the possibilities! I wanna play in this. This needs to be a thing right now. i agree with anne, the world needs this! There are places that do this. I will try to find references. Maybe it’s ’cause I’m old, but THAT makes no sense. “If we have the party at the amusement park, I’ll invite Sally and Betty and Joan, but if we have it at the beach I’ll invite Wilma and Samantha and Amy”? Is that a Northern thing, or a modern thing? Or a girl thing? I’d say the venue determines how many people you can invite? Like, a house party is 5-6 guests max before they stop fitting in your room, but once my classmate had a party at McDonald’s and invited literally half the class (including me, tho we weren’t even friends). So, funny thing. The one time I went to a trampoline park was when we held my friend’s bachelor party a few years ago. We had pizza and soda, played laser tag, mini golf, jumped on trampolines, and then we all went to our other friend’s house to play board games and watch anime. A few days later, he gets married. Definitely not one my expected “things to do when I am in my 30’s” list, but I enjoyed it. Lucky Amanda. :3 I wonder what else is gonna be at the party. Please, please, velcro walls and velcro jumpsuits as an extra thing in the bouncy house! We had a bounce house at the reception for my sisters wedding. Was great until some drunk puked in it.